The world population is exponentially growing and with it the global need for energy. If we imagine that consumption parallels population growth, then the demand -most notably for transport and heating, which consume vast quantities of energy – will continue to rise and solutions need to be put into place. Currently, electricity production is dependent on market prices for fuel, and more importantly the UK does not have security of supply. It is estimated that 10% of the UK’s electricity needs, are currently imported. With a quarter of the UK’s generating capacity coming to the end of its life over the next 10 years, as a nation we need to make strategic investments in our energy infrastructure that will be felt throughout the rest of the century. Furthermore as we progress towards the Government’s objective of secure energy, free of carbon, by 2050, electricity demand, by fossil, renewable and nuclear sources. 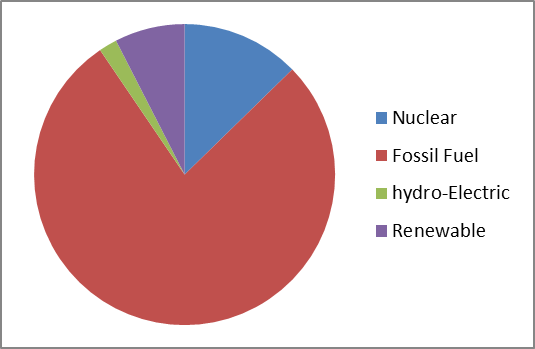 The pie chart below shows the UK current generating capacity by % production by fossil fuel, nuclear fission, renewables (solar, wind) and hydroelectricity. As we can see, fossil fuels provide the main provision for conversion to electricity primarily, due to economic favourability. Drawbacks to consider with fossil fuels are pollution from burning coal, gas and oil, mining and off shore drilling hazards, and also the national dependency on these sources from unstable countries in the far-east. ‘Renewables’ harness energy from their environment. Wind, solar, wave and tidal, for example, are driven by natural earth cycles. Unfortunately, these sources cannot be relied on to generate in the region of their maximum electricity output at all future times of high electricity need. This results in intermittency problems that put incredible strain upon the national grid. Nuclear power is generated using Uranium, which is a metal mined in various parts of the world. Research has shown that the seriously an extremely reasonable provision really can be from nuclear power . Unfortunately, the image of nuclear as a civil power source is controversial due to the fear of low level radiation creating illness or genetic mutations. These worries are completely unfounded, and a sole product of propaganda by politicians and journalists. Governments are turning to nuclear energy as a plausible form of energy because it is increasingly economic, reliable and environmentally friendly. The wind does not always blow and the sun does not always shine, but nuclear energy can be produced regardless of the weather, which is why the nuclear industry is almost an essential part of the future of sustainable energy. There is a global addiction to fossil fuels, but part of this addiction may be a fear to change. Incorporating nuclear energy can offset the environmental cost in terms of reduction of greenhouse emissions. Although the set up costs for nuclear plant tend to be higher to begin, with perhaps nuclear energy can have a positive impact in many different ways, looking at conflict provoked over the need for oil, problems of warming due to greenhouse gases, and the impact toxins have on health. 1) ‘Sustainable Energy Without Hot Air’ – Professor David MacKay considers how each potential energy source could meet consumption in the UK.